A few days ago, a dirty little blue box of death showed up in the mail — a DOD 680 analog delay pedal, made almost exactly 30 years ago (the sticker inside dates it to January 15, 1981; I was halfway through my sophomore year in high school). 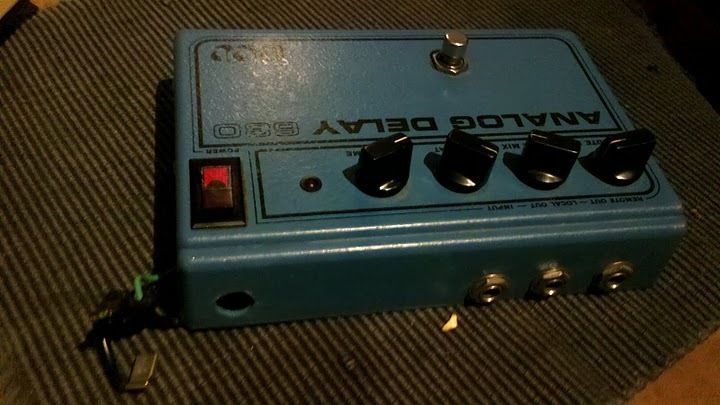 This is not a small cheap pedal of the kind DOD became (in)famous for in later years, but a heavy diecast steel box, bigger than a Stephen King paperback, made in Utah before the company was sold to Harman and then to Digitech. 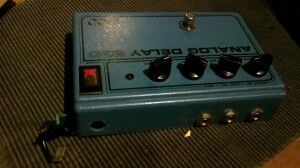 DOD 680 Analog Delay, built in 1981, with frayed power cord cut off. And then I unplugged it, and the next day brought it over to my parents’ so I could take advantage of my dad’s extensive collection of tools and electronics parts. Replacing a power cord is not difficult, unless you do it wrong twice (the first time, I wired it up correctly, but didn’t put the cord through the hole, so I had to do it again. Then I wired it backwards, which I discovered by checking the plug with a meter before plugging it in (or I’d have a dirty blue paperweight). So by the third time, the wire was (literally) running short inside the case and if not for my dad’s reservoir of patience (and supply of very small needle-nose pliers) it would have been a dirty blue speed bump on my parents’ street. Last night I used it to record a second piece, “4000 Kinds Of Sad (Dirty Blue Box II).” In both pieces, the thick harmonica sound is coming from that pedal (as well as from a few other things, including my beloved Fulltone OCD distortion pedal as well as a digital stereo delay). But if you push analog delay pedals out to their limits (increasing the delay time and the repeat time) they start to oscillate and feedback. The repeating delays are created by feeding the output back into the input, and if you do enough of that the signal just degrades to noise and the circuitry overloads and you get the crazy whooshing and howling you hear all the way through “4000.” The rest of the effects are created by filtering and equalizing the sound. Why sad? Why 4000? What is this analog delay thing anyway? The classic sound of amplified blues harmonica — made famous by generations of musicians beginning with Little Walter Jacobs in the early 1950s — is created by three things, not counting good harp playing with strong tone: a tube amplifier, a microphone of the type normally intended only for speech, and delay. The latter is a musical effect that does exactly what it says: it delays sound and repeats it. In Jacobs’ day, that was accomplished with a special tape recorder that recorded the sound and played it back a short time later. That was pretty much the only way to do it until the 1970s, when the bucket-brigade device was invented. A bucket-brigade is a delay unit on a chip. Basically, it receives an input signal and stores it in a capacitor. Then the contents of that capacitor are emptied into another one, and then into another one, and so on down the line. The length of time it takes the signal to get through all those handoffs is the delay time. When these were commercialized and inserted into guitar effects pedals in the late 1970s, the “analog delay pedal” was born. They were popular until the 1980s, when digital signal processing chips became cheap enough to replace them. Digital chips offered much longer delay times, and no loss of clarity as the signal was handed down the chain. But the warmth and the distortion of the analog chips sounds to many ears much better, and they’re used by basically any blues harp player who can’t afford one of the original Echoplex tape machines (or doesn’t want to lug it around, or doesn’t want to deal with repairing it and replacing the tape). Years ago, I bought one of these pedals (the DOD FX96) and brought it to one of Bob Elliot’s wonderful jam sessions at The Studio. He looked at the “analog delay” label on it and said, “Analog? Come on — where are the tubes?” But analog doesn’t mean tubes. It simply means that the signal is reproduced in its entirety rather than as a series of numbers. Essentially, a digital processor looks at the signal a few thousand times a second, converts it to numbers, and saves the numbers. Your CDs are all 16-bit 44KHz wav files. That means the music was sampled 44,000 times a second, and each time, converted into a 16-digit binary number. That sampling rate is enough to reproduce the audible sound exactly. A vinyl record, however, is analog. The music is not divided up into pieces, but reproduced continuously — every bit of sound goes onto the vinyl. And it’s not converted to numbers. A loud noise makes a wider cut into the vinyl, whereas a soft sound makes a narrow cut. The size of the groove is exactly related to the sound that came in, with no digital intervention. But as it turns out, these analog delay pedals are not entirely analog. The tiny buckets are filled and emptied on a schedule set by a clock on the chip. The faster that clock runs, the faster the signal gets from one end of the chain to the other, and the shorter your delay time. So the samples are taken digitally — it doesn’t listen to the signal continuously, but instead, only when the clock tells it to. But the samples themselves are analog. The chip doesn’t convert the signal to numbers, but instead stores it in the buckets exactly as it came in. The chip in my dirty blue box is the Reciton SAD4066. The “SAD” stands for “Sampled Analog Delay,” and the 4096 is the number of “buckets” it has. Reciton, one of the many spinoffs of the legendary Fairchild Semiconductor, was the first company to commercialize the bucket-brigade delay. 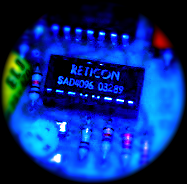 The Reticon SAD4096 bucket-brigade delay chip inside the DOD608. Later, companies like Panasonic jumped on; their chips are used in another series of legendary analog delays, Roland’s Boss DM-2 and DM-3. (I’ve been using the latter for years in my blues playing, but if I am able to start doing Saboteur Tiger shows again, I’ll probably have the Dirty Blue Box with me.) And I hope to be doing more modifications and repairs on these little devices; they’re wonderful and often much easier to fix than you’d think.